Seminars. 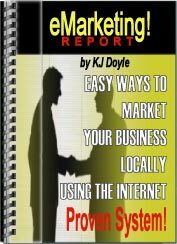 Using the Internet to promote your business LOCALLY. that wants to learn how to use the Internet to promote itself LOCALLY ... before wasting any more money! that wants to learn how use the Internet to promote itself LOCALLY ... before money is wasted! and how to use it to promote your own business. Seats are limited and will sell out fast. plus download instructions for the [above] eReport. Note: Only ONE registration per unique email address! Trouble Registering? ... then EMAIL Us! Register your interest. Complete the form [right]... We'll email you when the next seminar is being held.